After the president met with the deputy attorney general and the FBI director, the White House said some in Congress will get the info they asked for. The White House says the Department of Justice will allow congressional leaders to see classified material they requested about the FBI's investigation of the Trump campaign. This comes after a meeting at the White House between President Donald Trump, FBI Director Christopher Wray and Deputy Attorney General Rod Rosenstein in which the president reportedly pressed them for information on what he calls an FBI "infiltration" of his campaign. Newsy previously reported the DOJ had asked its inspector general to find out if there was political motivation behind the FBI's probe of the Trump camp. The New York Times and The Washington Post reported an FBI source interacted with various Trump campaign aides in the runup to the 2016 election. While Trump has suggested the source was "implanted" in his campaign, the Times says the source was dispatched to communicate with the campaign only after the FBI found suspicious ties between aides and Russia. The White House says chief of staff John Kelly will sit down with leaders of the intelligence community and Congress to look over the classified information. The prospect that that could include the identity of this so-called informant has critics worried. "The first thing you learn when you get involved with the intelligence community is you have to protect sources and methods," Sen. Mark Warner said Sunday on CNN. "People's lives depend upon it." The White House said Trump's meeting with Wray and Rosenstein on Monday also resulted in an agreement to look into "irregularities" in how the FBI or DOJ treated the Trump campaign. 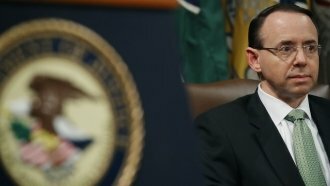 Deputy Attorney General Rod Rosenstein said Sunday if anyone did encroach on the campaign "we need to know about it and take appropriate action." That statement isn't sitting well with Trump's critics. "They know that's nonsense," Rep. Adam Schiff said.